a formal vocabulary, namely, the ontology, built from the terms defined in the spreadsheets. The ontology is coded in the DL-LiteA, a formalism of the Ontology Web Language (OWL) which outperforms most of the other description logic formalisms in the context of managing data distributed in heterogeneously structured sources. The former element consists of the Standard Tables, in which the terminology, descriptions, units of measures and relationships between concepts are described. The Standard Tables act as a connection between the available information (e.g. in the form of permanently stored data) and the knowledge of experts as expressed in technical standards and use case specifications. Therefore, these tables stand for a conceptualisation of an interdisciplinary domain (i.e. an urban energy system) by providing the definition of the terms which experts consider to be relevant to the problem at stake as well as the relationships between concepts. The process of relating existing data structures to a vocabulary is the collaborative work of ontology designers and domain experts. Ontology designers contribute with their knowledge about representation techniques, while domain experts bring their expertise in the practical application of the data and tools involved in the process. The Standard Tables are created applying existing technical standards in order to guarantee that the ontological modelling is developed through an official and shared terminology. In fact, technical standards are typically the means by which experts agree on a common vocabulary in a particular domain. 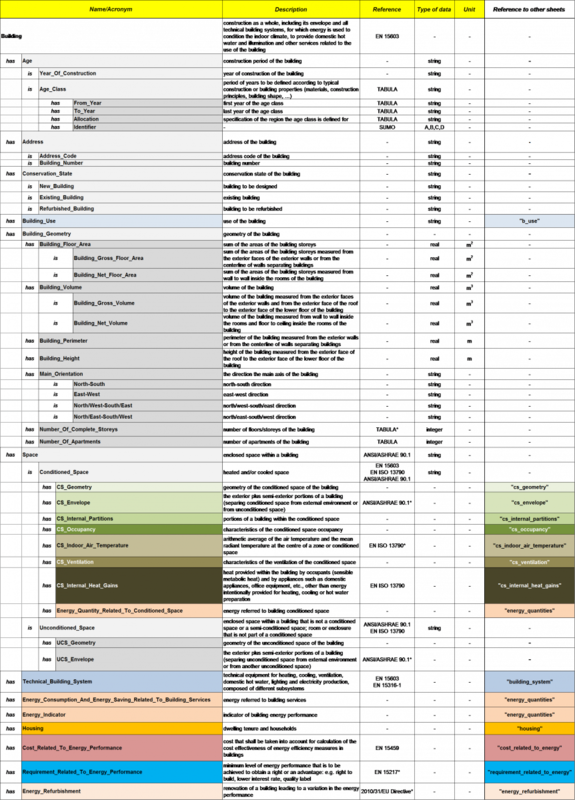 the name of other Standard Tables (sheets), in which that concept is further detailed (identification of relationships with other concepts). A total number of 25 Standard Tables have been created in the SEMANCO project, covering different domains (i.e. data categories) and encompassing about 1000 concepts. The deliverable is aimed at: a) describing the methodology to present and classify the characteristics of data used for energy and environmental analyses at different scales, b) presenting the data fields necessary to describe data in a detailed and complete way, c) classifying the information to be provided on the data sources with reference to availability and technical accessibility. The energy data classified in Del. 3.1 are modelled according to international standards, like ISO and CEN standards. Besides these standards, energy data models proposed by some European projects are analysed and considered in the modelling of non-structured energy datasets. The deliverable deals with the following issues: a) the identification of the categories of data to be semantically modelled according to a precise structure, b) the analysis of the main international standards for energy data modelling, c) the definition of the ontology structure and the creation of the Standard Tables, c) the elaboration of mapping tables to create correspondence between the ontology and input data deriving from the data sources or from the tools. In the deliverable the data not recognised in the energy standards (e.g. building categories, pollution levels, socio-economic data, transportation flows, geographic data) are modelled using currently available standards. Deliverable 3.3 deals with the following issues: a) the identification of the categories of data to be semantically modelled according to a precise structure and definition of the categories included in the contextual data group, b) the analysis of standards and references for energy-related data modelling, c) the creation of the Standard Tables for the contextual data, d) the interconnections between the Standard Tables on the energy data (Del. 3.2) and the Standard Tables on the contextual data, and the identification of the different territorial scales to which the Standard Tables are applied. Semantic web technologies can help to integrate heterogeneous data sources, and to make them accessible to the stakeholders involved in the urban energy planning. In the SEMANCO project, semantic technologies have been used to create models of urban energy systems able to assess the energy performance of an urban area. 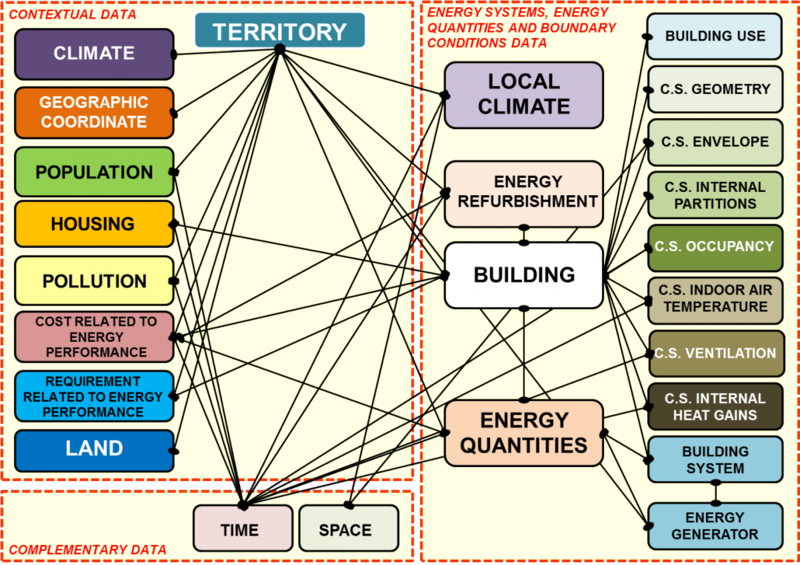 A semantic energy information framework brings together the data sources at different scales and from different domains (e.g. urban planning, energy management), as well as some energy simulation and assessment tools that interact with the semantically modelled data. An ontology based on a vocabulary of concepts shared by experts has been created through the following process: capturing the experts knowledge about a specific problem regarding the energy efficiency of an urban area and the data needed to model it; creating an informal vocabulary through the terms referred to technical standards, and creating a formal vocabulary according to the Ontology Web Language specifications. This ontology has been applied to three case studies in the SEMANCO project. The ontology can be reused in other cases dealing with modelling of urban energy systems using semantic technologies and its underlying methodology – knowledge capturing, informal vocabulary creation, ontology building – could be replicated in other domains.